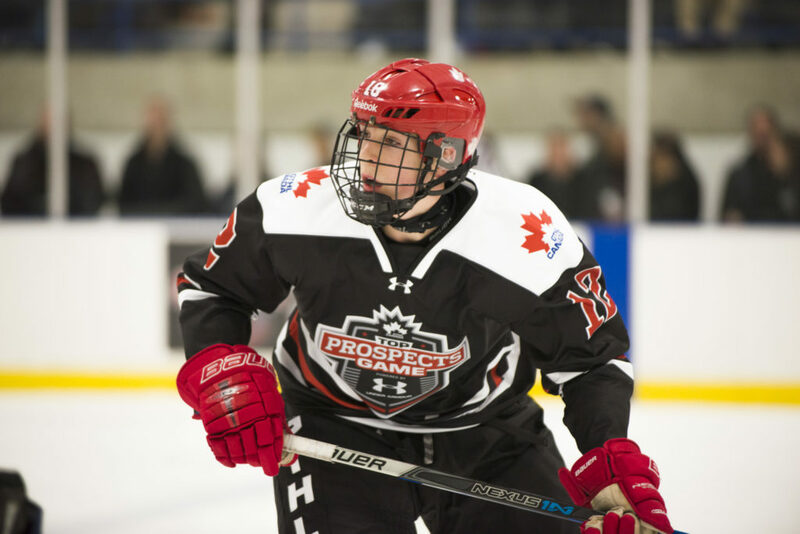 Since it’s inaugural year in 2010, the GTHL Top Prospects Game, Powered by Under Armour has seen over 300 players participate in eight different showcases. Most valuable players, one from each team, is selected at the end of the game. 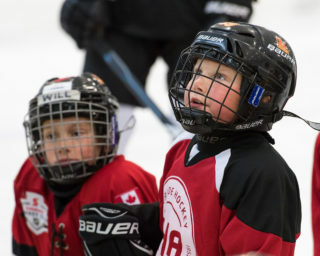 Many who have been awarded MVP honours go on to pursue professional hockey careers, but not all have taken the same path. Here’s what your Top Prospect MVPs have been up to. The inaugural GTHL Top Prospects Game showcased the best of the 1994 birth year, with Robert Polesslo (Jr. Canadiens) and Matia Marcantuoni (Jr. Canadiens) coming out on top as game MVPs. Since the 2010 event, both players have stayed involved with the game. After playing two seasons with the University of Vermont, Polesslo joined the Kingston Frontenacs of the OHL, accumulating over 70 points in two seasons. He is currently in his third year with the University of Western Ontario Mustangs. Playing four seasons with the Kitchener Rangers of the OHL, Marcantuoni was drafted 92nd overall by the Pittsburgh Penguins in the 2012 NHL Entry Draft. 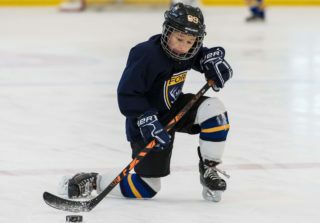 He has since spent time in both the AHL and ECHL, and currently plays for the Tucson Roadrunners of the AHL – the affiliate to the Arizona Coyotes. 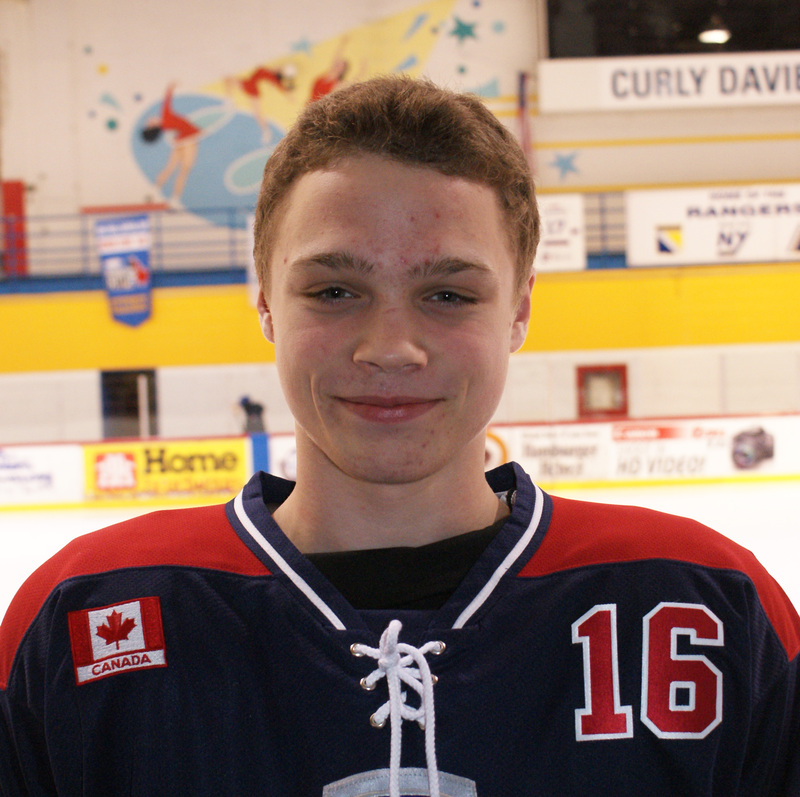 Max Domi prior to the 2011 GTHL Top Prospects Game. Max Domi has gone on to become a household name since receiving MVP honours at the 2011 GTHL Top Prospects Game. 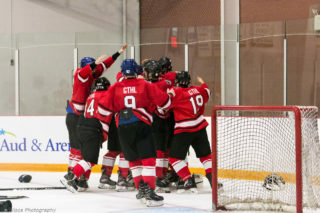 The former member of the Don Mills Flyers won gold with Canada’s World Junior team in 2015 and currently plays for the Arizona Coyotes in the NHL. Then the captain of the Toronto Marlboros Minor Midget squad, Bryson Cianfrone carried his leadership qualities over to the OHL where he wore a letter in all three of his seasons – two with the Mississauga Steelheads and one with the Owen Sound Attack. He currently plays on the men’s varsity squad at St. Francis Xavier University in Nova Scotia. Drafted by the 22nd overall by the Vancouver Canucks in the 2009 NHL Draft, Dante Salituro (Don Mills Flyers) played with the Ottawa 67s for four seasons before stints in both the AHL and ECHL. He currently plays for the Rapid City Rush in the ECHL – an affiliate of the Minnesota Wild. Playing alongside Connor McDavid during his Minor Midget season with the Toronto Marlboros, current Calgary Flames forward Sam Bennett is in his fourth NHL season after being drafted 4th overall by the Flames in 2014. The 1997 age group had a particularly strong draft, with names like Dylan Strome and Mitch Marner leading the way. 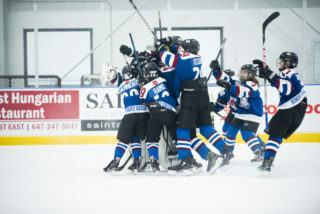 Although these stars were each on a GTHL Top Prospects roster, it would be Nicolas Mucci and Nikita Korostelev who would stand out in the game. Mucci, a former member of the Jr. Canadiens, played in several junior leagues, including the OJHL, before playing for his current team at Niagara University in the NCAA. 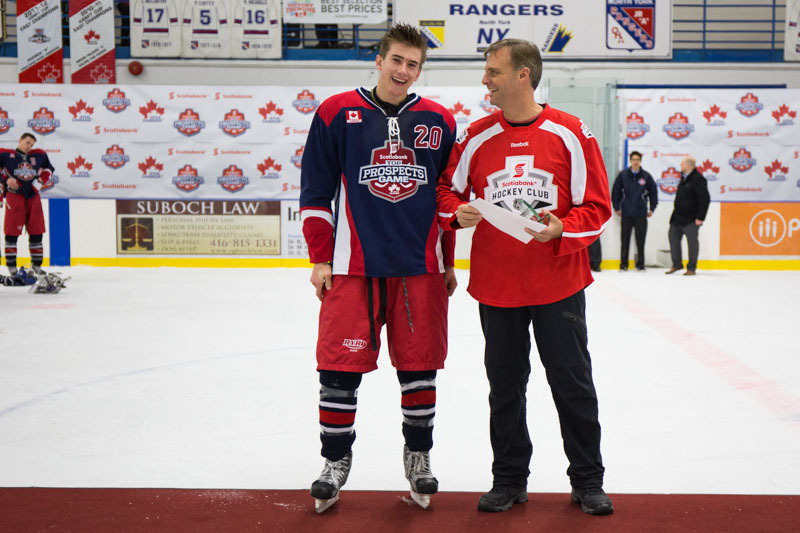 Mucci shared MVP honours with his Jr. Canadiens teammate Nikita Korostelev, who was drafted in the 7th round in 2015 by the Toronto Maple Leafs. After four seasons with the Sarnia Sting, Korostelev now plays a key role with the Peterborough Petes. Current Mississauga Steelheads captain Michael McLeod accepting MVP honours. Goaltender Jack LaFontaine helped lead his Top Prospects squad to a 2-0 victory at the 5th annual rendition of the event. The former Don Mills Flyers standout was drafted 75th overall to the Carolina Hurricanes in 2016. He is currently in his second season at the University of Michigan. After leading his Toronto Marlboros team to an OHL Cup victory, Michael McLeod was drafted 12th overall to the New Jersey Devils in 2016. He is now in his fourth season with the Mississauga Steelheads of the OHL and has been assigned the “C” for a second straight season. Like Top Prospects teammate Quinton Hughes (Toronto Marlboros), Jacob Tortora (Don Mills Flyers) played for the U.S. National Development team for three seasons after graduating out of the GTHL. He now plays for Boston College (NCAA). Goaltender Brendan Bonello (Toronto Titans) has played in the OHL for the last three seasons and was recently traded to the Kingston Frontenacs after his time with the Saginaw Spirit. A standout for the Halifax Mooseheads of the QMJHL, former Mississauga Senators goaltender Alexis Gravel is in the pool of highly touted prospects for the upcoming 2018 NHL Draft. 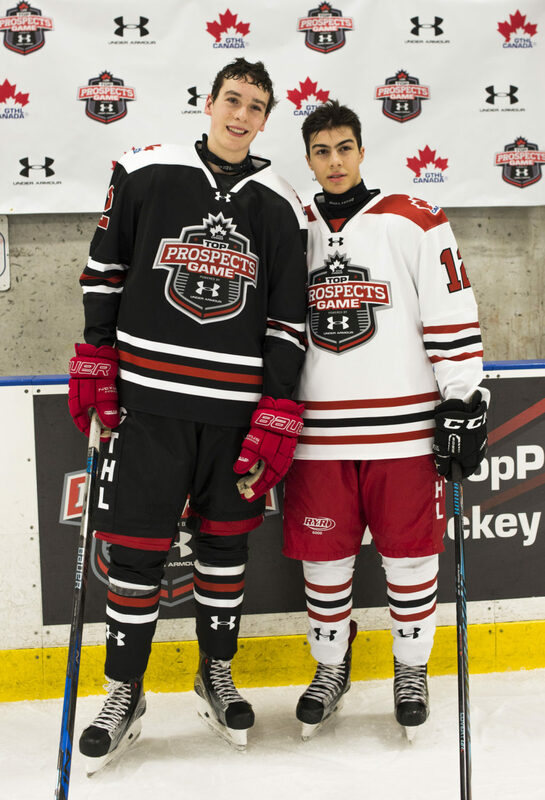 Mason Primeau (left) with Eric Ciccolini (right) at the 2016 GTHL Top Prospects Game, Powered by Under Armour. A third-round selection by the North Bay Batallion in the 2015 OHL Priority Selection, defenceman Travis Mailhot spent time in the OJHL before starting his OHL career with the Batallion this season. 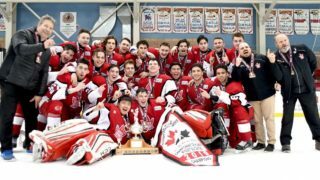 Mason Primeau’s Minor Midget season with the Toronto Young Nationals was highlighted by a GTHL regular championship win and an appearance in the OHL Cup, Powered by Under Armour final. His standout season caught the eye of the Guelph Storm of the OHL who drafted him early in the second round. Primeau scored his first OHL goal for the Storm mere weeks ago. Like Primeau, Eric Ciccolini (Vaughan Kings) was also selected by the Guelph Storm in the 2017 OHL Priority Selection. 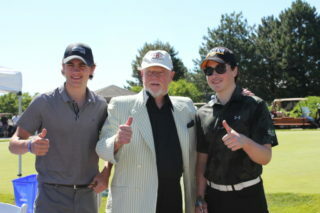 He currently plays for the Toronto Jr. Canadiens in the OJHL. Click here to purchase tickets to the 9th annual GTHL Top Prospects Game, Powered by Under Armour.